It’s 2014, so most companies who come to WebFX for Social Media strategies already have some sort of social media presence, whether it is simply a page they claimed and left to deal with later, a few profiles across the web with different names, or a budding social media strategy that got put on hold when an employee left. All of these can cause problems when they are handed off, whether to an internal marketing employee, or my team. Most of these issues are related to Facebook and customer service is not part of their business model. So, when I say “cause problems”, I mean, in some cases, we have to abandon a Facebook page with hundreds of fans, or activate major damage control because an ex-employee or ex-agency is the sole admin. Believe me, you don’t want to find yourself in any of these situations, and they can be avoided! 1) Never give another individual access to your personal Facebook profile. Take this as relationship advice if you will, but if you give someone access to your online identity that is linked directly to your real-world identity, you’re taking a major risk. 2) Never make one individual the sole admin of a company Facebook page. If they ever leave your organization, your page is essentially kidnapped and held for ransom. Never fun. (In fact, the same is true for any number of employees who have access. You don’t want to leave your page’s fate up to HR). 3) Never allow your agency to create your Facebook Page and not add you as a Manager. If the relationship goes south, you’re risking a lot of money and effort. 4) Never create a “dummy” Facebook account and name it “Company Name”. Facebook now automatically gives that profile the URL “Facebook.com/CompanyName” and you will not be able to claim it for your business page. …Believe it or not, your personal profile does not have to be involved with your work life, either! Create a dummy profile. I’ll say it again: Create a dummy Facebook profile. (You’ll have to give it a name, so make it your name or create a name to use). From now on, make this your company’s Facebook manager account. Be sure to set this up using an email address that you will not lose access to (ex: company@gmail.com vs. me@webfx.com) and make the email password different from your Facebook password. If a relationship ever sours, anyone else with access to the Facebook page can change the Facebook password, but you will have ultimate control because you have access to the email address connected to it. While Facebook frowns upon dummy profiles, they have not created any alternative process for businesses. I agree that using all of your employees’ personal profiles seems easy, but you can end up with one person left as a Manager and no access to the page because the employee a) won’t give you their login or b) has left the company and will not communicate with you. This would be a perfect solution, if there weren’t a variety of restrictions on these types of accounts. Andrea Vahl outlines them in a helpful blog post. My least favorite limitations: no search bar or any ability to search for other pages or topics from this login and no ability to ‘like’ other pages as your page. But, the worst one is the cell phone verification process that (sometimes) appears for setting pages up in this fashion. In my opinion, connecting a personal cell phone to a company page is worse than connecting a personal Facebook profile! Once you have your Manager profile set up, you can give admin access to individual users, or allow them to use your Facebook login to use the Manager profile. 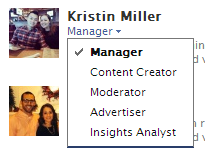 Just ensure the Manager profile is the only account at “Manager” level on the page. Facebook gave into businesses’ and agencies’ wishes by putting different admin “levels” in place. Use an agency for content only? Make their account “Content Creator” only. Use a consultant for advertising only? Make their account “Advertiser” only. Always ensure your manager account. If you have an employee who will only need to reply to comments and you don’t want them posting status updates, make them a “Moderator”. Like I said, most businesses already have a Facebook page, so is there a way to remedy a pre-existing set up? Sure! Set up a dummy Facebook profile to become your Manager account and make it a Manager of the page. Then, change everyone’s admin levels appropriately. Have a “hijacked” page? If you can request the person at Manager level to give you access, that is the best route. Facebook specifically says the only way to become an admin is for an existing admin to add you. Note: there is no way for a page to be without an admin unless it was set up as a page only. Facebook will not allow the page to have 0 admins associated with it. 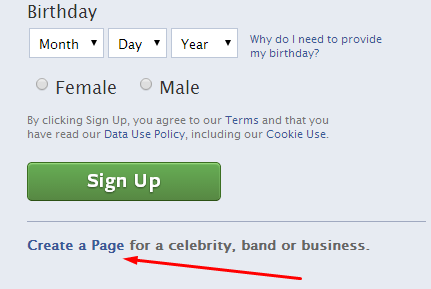 Facebook also has a way to report that you are the authorized representative of a page. You may need a company phone bill on hand for this option. Did you already know all of these tips? The entire topic may seem mundane, but when you consider the risks of having a disgruntled employee speak on behalf of your brand to thousands of followers, setting up a Facebook page for your business requires some thought! Unfortunately, Facebook doesn’t provide much by way of best practices, so I thought I’d save you any future hassles by outlining the best process possible – for now. Have you ever had a page “hijacked” and no success in retrieving it again? Tell me in the comments! Kristin Miller is an Internet Marketing Analyst at WebFX. She likes cats, music and developing social media strategies. Follow her on Twitter at @KristinMiller77.